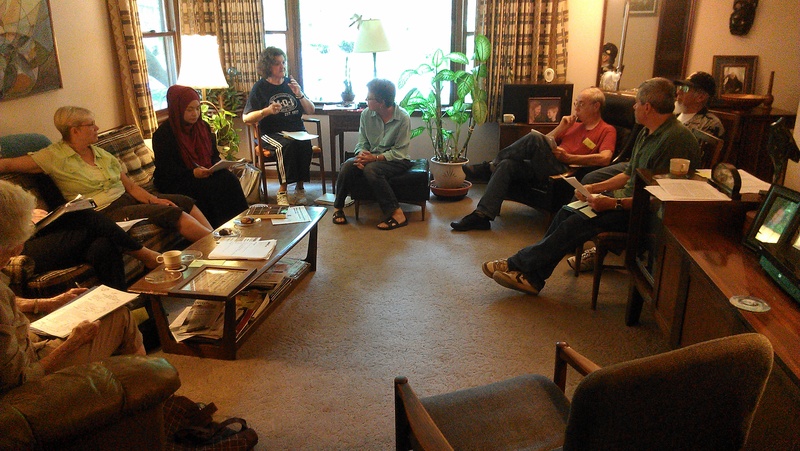 Steering Committee Meeting, June 2014: Monthly meetings plan programs and actions. The DeKalb Interfaith Network for Peace and Justice was organized in the spring of 1985 by members of several local congregations in order to pool efforts on issues of common concern. The initial focus was on ending U.S. support for the wars in Central America. The focus has since broadened to include a variety of peace and justice issues on which the network seeks to educate ourselves and the community. We have sponsored many programs for the public, bringing in speakers from around the world. The Network utilizes a three-pronged approach in carrying out our goal: education, action, and income. The Network raises money through contributions from individuals, support from local congregations, and donations made at programs.